What is Traffic & Conversion Summit? It's a fact. Digital marketing changes FAST. And that's why every year, for the last 10 years, thousands of the world's smartest marketers have descended upon San Diego, California to learn what's new, what's hot, and what's actually working RIGHT NOW in digital marketing. Now, it's your turn. If you're a marketing professional, agency owner, consultant, or entrepreneur, Traffic & Conversion Summit is YOUR event. Welcome home. Thousands of the world's smartest marketers return to Traffic & Conversion Summit for one reason: The Content. 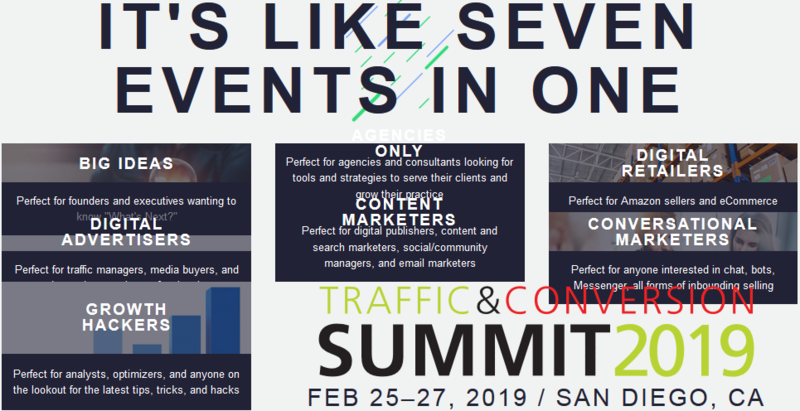 Traffic & Conversion Summit is 3 full days of actionable, proven, strategic content from experts (and a few celebrities) that have been in your shoes and have turned their businesses into juggernauts. There is no "conceptual thought" or "theoretical strategies" behind any of these sessions. Everything you hear at Traffic & Conversion Summit are tested, proven tactics to increase traffic, conversions, and sales. You'll walk out of the hotel on Day 3 with notebooks (or word docs) full of actionable growth strategies that you can apply the second you get to a computer. Last edited by BlackHatX; 03-02-2019 at 09:56 PM. We Need 7 Members Only!! Interested if it's still open ! how about we group buy that for $7 each? All times are GMT +6.5. The time now is 10:39 PM.